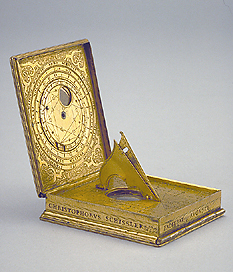 Christoph Schissler was a very productive instrument maker, especially of dials and time keeping devices. Most of his instruments are finely decorated and engraved, and this example is no exception. It is very similar to another compendium (Epact 49960), not signed, and held in the British Museum, London.